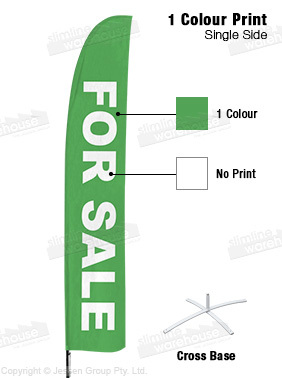 These custom fabric flags, screen printed banners have 1, 2, or 3 colour printing options on a single side of the flag. The printing process used with these flags is budget friendly, and great for businesses that need a large of quantity for their locations. The 3.5m tall display can be seen from across a field or exhibition hall to alert potential customers of your business. These screen printed banners have a carrying bag provided for transport between events. You can also store the whole kit in between uses to keep it free of grime or dust. 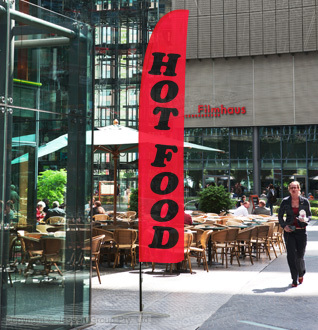 These outdoor promotional signs can also be used indoors, thanks to the cross base that fits on any flat surface. Extra stability can be achieved using the water bag that is provided. Assembly is quick and easy without any tools necessary!